An Ordering Instrument is a contract type that has already been established. There are many type of ordering instruments available to contracting professionals. These contract types save time, money and resources. One of the best methods in using ordering contracts is that competition is maintained after the initial competition when award is made to two or more contracts. 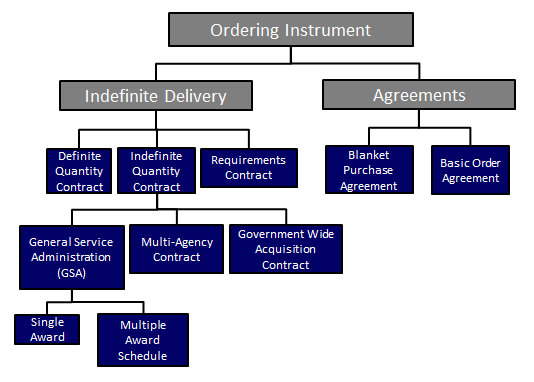 The figure below represents a breakdown of the main ordering instruments available to Program Managers (PM) and Contracting Officers. The General Services Administration enters into Government-wide contracts with commercial firms to provide commercial products and services, at stated prices, for a given time period. Federal agencies place orders directly to schedule contractors and the contractors makes deliveries to the customer. Multi-Agency Contracts are indefinite quantity contracts that one agency establishes which can be used but other government agencies to obtain supplies and services, consistent with the Economy Act. Government Wide Acquisition Contracts (GWACs) enable federal agencies to buy cost-effective, innovative solutions for information technology (IT) requirements. GWACs provide access to IT solutions such as systems design, software engineering, information assurance, and enterprise architecture solutions. Small business set-aside GWACs also provide socioeconomic credit. OTA is the term commonly used to refer to the 10 U.S.C. 2371 authority to enter into transactions other than contracts, grants or cooperative agreements. The Department currently has temporary authority to award “other transactions” (OTs) in certain circumstances for prototype projects that are directly relevant to weapons or weapon systems proposed to be acquired or developed by the Department.